Simple, easy-to-use interface displaying the most relevant and informative distilled network data. Drag and drop configurable dashboard. Add your gadgets, setup your filters and arrange it the way you want it. Investigating a specific conversation, user or application is quick and easy with single click drilldowns which provide a complete picture of all traffic characteristics relating to a single reference point. Get a near real-time view into total network bandwidth utilization segmented by incoming, outgoing and local traffic. The same can be viewed per user, conversation, application and more. Setup an alert to notify you if the bandwidth rate or traffic usage of a particular user, group or application exceeds a predefined limit. Get notified by email to stay on top of your network. Generating historical views of your traffic is easy with SparrowIQ’s built-in reports. This, coupled with its drilldown capability, provides endless traffic perspectives that can also be converted to PDF format for easy distribution. SparrowIQ lets you create custom groups and filter network traffic accordingly – seeing the affect on the dashboard gadgets and reports. You can setup an alerts to notify you if the sales or engineering group generate excessive traffic. 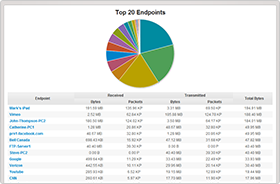 SparrowIQ quickly identifies which users are hogging excessive bandwidth slowing down the network – perhaps downloading unusually large files , watching online movies, or emailing large PowerPoint decks to entire departments. Risk free 15 day trial! SparrowIQ – Designed by Solana Networks © 2019 Solana Networks Inc.